Charlie Brown is searching. For meaning, for escape from materialism, for Christmas. Hopefully for better friends if he’s half in his right mind. He confides in his pal Linus that even with Christmas coming, bringing presents, and holiday cheer, he still feels melancholy. He looks in his mailbox for a Christmas card. Maybe a connection with another kid will cure his angst. He visits the 5 cent psychiatrist. Maybe the right thinking is the answer (though if Lucy is any sort of barometer, the right thinking is apparently all about the Benjamins [or at least the Jeffersons]). Finally, Chuck’s enlisted to direct the town Christmas pageant. Maybe a satisfying career will put his heart at ease. We certainly get to see how that works out for him. Meanwhile, Snoopy is diving into Christmas commerce full tilt, festooning his doghouse and erstwhile WWI fighter plane with an arsenal of lights and ornaments. At the pageant rehearsal, Charlie Brown learns a lesson in herding cats. Even revelry and merriment can’t cure what ails him. Determined to find the right meaning for his Christmas play, Chuck sets off to get a tree. A nice, shiny aluminum one, Lucy shouts after him. Gotta look the part. At the Christmas tree lot, confronted by an explosion of neon kitsch, Charlie Brown nearly despairs until he finds a tiny real tree. Spindly, but real. Real wood. Real needles (a whole rain of them). It’s the least commercial, most plain thing Charlie Brown has seen in his whole town. With pride, he takes the one true tree back to show the others. And his humble offering earns him humiliation. What a blockhead. So much for the Christmas spirit. Linus knows. In what may be the last place a passage of Scripture gets a sincere reading in all of prime time TV, Linus recites Luke 2:8-14 center stage in a single spotlight. Beneath all the hyper-exaggerated veneer, Christmas is really about something as simple as the birth of a baby (albeit a birth announced by angels and the glory of the Lord). It’s the emotional turning point, the moment of quiet clarity. One a side note, maybe all that glory shone round about those shepherds has been echoing through the years and in an effort to re-capture it DIY style, people have just gotten a little crazy. Maybe the aluminum trees are just an over-cooked impression of something real after all. Of course, all that is the easy stuff. Commercialization of Christmas is gaudy and superficial. Where’s the goodwill towards men? Tone it down, am I right? That’s only half the point and in the next 5 minutes, Schultz and the animators drive home a seditiously counter-cultural point. The cure to Charlie Brown’s Christmas blues is not just toning it down for the sake of simplicity, it’s exposing the hollowness of mere tradition and DIY glory and replacing it with something enduring. 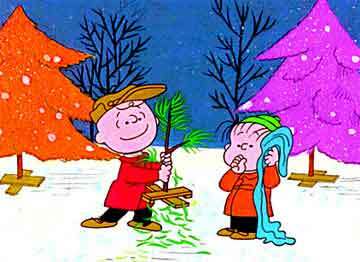 Comforted by Linus’ soliloquy, Charlie Brown carries his Christmas tree home. As he’s walking through his snow-bound town, all the other trees are stooped under the weight of the snow. Bowing in the direction of Chuck’s sad little tree oddly enough, seemingly giving due deference. At home, Charlie is astounded to see what his dog’s been up to. Snoopy has fed right into the hype and glitz of his culture, done his little red dog house up into a festive juggernaut, and received his reward. First place. Good grief. Charlie takes a crimson ornament, a token of Snoopy’s best effort, and hangs it on his tree. The poor, wretched thing buckles under the weight. ‘I’ve killed it.’ Indeed, Chuck. Haven’t we all? A dejected Charlie Brown heads in from the cold. The rest of the kids show up (to apologize for berating poor Charlie Brown if they’re halfway decent people) and start to notice that the tree ain’t all that bad. Just needs a little tlc. Snoopy can probably spare some lights and bells. But wait. Is the whole premise about to come undone? Is the commercialist brigade going to take the last lonely refuge of pure simplicity and bling it into oblivion? Not really. When they’re done, it’s still a real tree. Just one that’s fully revealed. And it looks way better than the blandly colorful aluminum clangers at the lot. I don’t think it’s an accident that the kids start humming ‘Hark, the Herald Angels Sing’. Glory to the newborn king. Indeed, glory has found its home. Not on a dog house, but on the one true tree. The emblem of Christmas. Snoopy’s reaction might just be the most subversive moment of the whole show. His glory has been robbed and ended up on this tree and instead of moping or snarling about it, he joins the singing. Every tongue confesses that the lights look better on the tree, even the one who thought he had cornered the market on glorious display. Charlie Brown comes back out and is touchingly stunned to see what’s become of his lowly little tree. His faith has been rewarded with a beautiful vision far more than he could have imagined. Merry Christmas, Charlie Brown. See for yourself, legally, here.